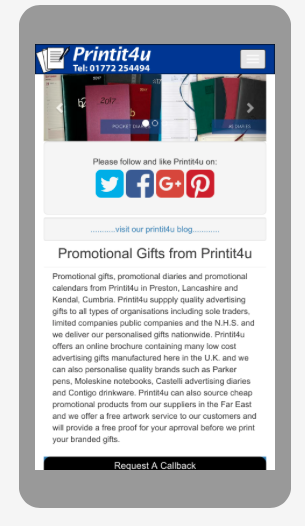 Printit4u with offices in Preston Lancashire and Kendal Cumbria has a new website which is now fully responsive to the device it is being viewed on. Please visit our new site where you can view details of all of our cheap promotional products many of them manufactured here in the U.K. Printit4u can now also personalise quality brands such as Parker Pens, Moleskine Notebooks, Castelli advertising diaries, Contigo drink ware and promotional calendars from Reeve, Rose, Aston and Brunel. You can now follow Printit4u on our social media websites. We will keep you up to date with news and images of the latest promotional diaries and latest ideas for promotional gifts. Please visit our Facebook, Twitter, Google+ , and Pinterest social media websites. We have just published our new website for our promotional calendars. The website is fully responsive to the device that you are viewing it on. Please visit the site at www.promocalendars.co.uk and let us know what you think. We have put below a screenshot image of the homepage to give you a taster. Over the past year Printit4u has been busy developing its websites. 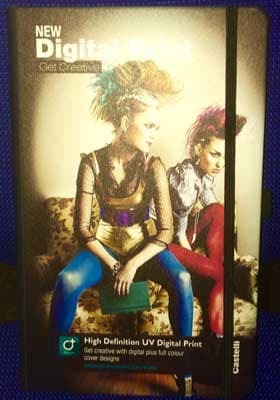 We now have www.printit4u.co.uk for promotional gifts and advertising diaries. We have a dedicated website for promotional calendars at www.promocalendars.co.uk and we have a new dedicated website for your ncr printing requirements at www.ncr-forms.co.uk from here you can receive your online quotations for ncr books, ncr pads and ncr sets. Our latest website at www.ncr-forms.co.uk is a responsive website and so adapts according to the device you are viewing it on. If you are viewing on a smartphone you will see a slimmed down version but still be able to receive your online quotes. Please give us your feedback. We have now fully updated the new ranges of advertising calendars and promotional diaries and this year we have over 450 calendars titles to choose from and two exciting diary ranges, you can also view our online searchable brochure of advertising gifts so please visit our three sites and we look forward to being of service to you. Great news! 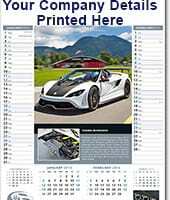 - we have just finished upgrading our sister website at www.promocalendars.co.uk this is a site dedicated to promotional calendars and all the new titles for 2013 are now showing. We now have 4 major calendar collections with over 430 titles to choose from. Reeve Calendar collection, Brunel calender collection, Lockwoods calendar collection and Rose calendar collection. The site at www.promocalendars.co.uk has also been greatly expanded. We now have dedicated pages for desk calendars, cd calendars, charity calenders, academic calendars, bespoke calendars, eco-freindly calendars, shipping calendars, business calendars, commercial calendars and personalised image calendars. Hope you all like the improvements. We have decided to publish a blog to keep all our customers abreast with all the latest products and services we offer here at printit4u. We have realised that some of our customers are unaware of all the services we offer. Basically we have two divisions to our business. Division 1 We design and print NCR business forms - please visit our ncr books webpage.